SIBLINGS: Kate is the second oldest child (oldest daughter) in a family of eight children. In 2008 was awarded an Obie Award for her performance as Clytemnestra in Iphigenia 2.0 at Signature Theatre Co. In 2007 was nominated for the 73rd Annual Drama League Award for her performance in 'Our Leading Lady'. In 2004 received Carbonell Award for Best Actress (Touring, Independent Production - Cuillo Centre) for her portrayal of Katharine Hepburn in Tea at Five. In 2003 received Broadway.com's Audience Award for Favorite Solo Performance in Tea at Five. In 2003 received an Outer Critics Circle nomination for Outstanding Solo Performance in Tea at Five. In 2003 received a Lucille Lortel nomination for Outstanding Lead Actress for Tea at Five. Mulgrew won the Saturn award for Best TV Actress presented by the Academy of Fiction, Fantasy and Horror Films for her portrayal of Captain Kathryn Janeway on "Star Trek: Voyager". The 24TH annual Saturn Awards were presented Wednesday night, June 10, 1998 at the Park Hyatt Hotel in Century City by the Academy of Fiction, Fantasy and Horror Films. 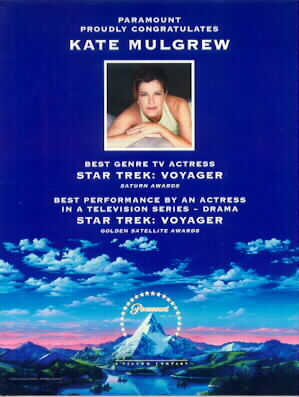 Mulgrew won the Golden Satellite Award for the best actress in a TV series drama for her portrayal of Captain Kathyrn Janeway on "Star Trek: Voyager". The 2ND annual International Press Academy's Golden Satellite Awards were presented in February 1998. Formed in 1996 the International Press Academy is an alternative to the Hollywood Foreign Press Assn. and its Golden Globe Awards. Mulgrew won the Tracey Humanitarian Award for her performance as driven alcoholic news anchor Hillary Wheaton on a 5/4/92 episode of "Murphy Brown" entitled "On the Rocks". Mulgrew received an Honorary Doctorate of Letters for Artistic Contribution from Seton Hill University in Greensburg, PA.
Mulgrew received a Golden Globe Award nomination for best dramatic actress in a series in 1979 for "Mrs. Columbo".